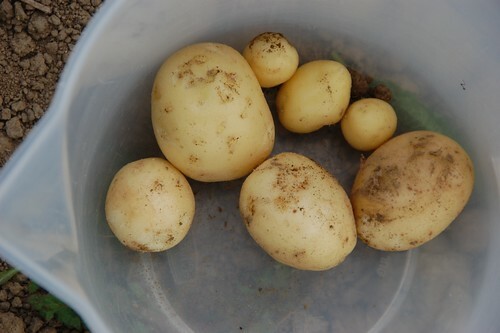 Today, the 15th May 2011 I harvested the first new potatoes. They were planted on the 28th March making it 48 days from start to finish, just under 7 weeks. I wasn't really expecting anything for another three weeks although Swift is a wonderfully fast early potato, but there was a plant a bit too close to a pathway that was annoying me, so I thought I'd scrape down and see if it was time to move it, and it was. I ate the last dish of the old stored crop from last year only a few days ago, the 6th, long keeping Swedish Mandel which weren't too bad at all. I don't think we've ever managed year round potatoes from the garden before, it's quite a triumph. The Swift plants are very short and don't seem to flower. I found a few buds on the plants but they were already aborting and falling off. I don't think this is because of the dry weather, I don't recall ever seeing them flower before. In a way this makes it harder to decide when to harvest as for most varieties waiting until they've flowered is a good rule of thumb. 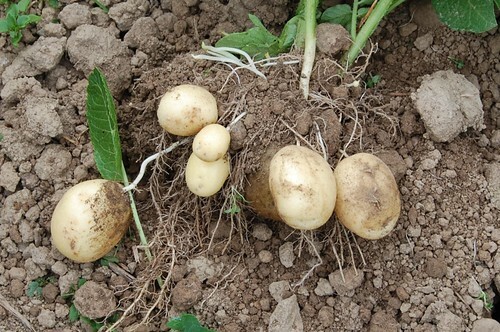 If we'd had just a touch more rain I think the smaller tubers would have bulked up too. 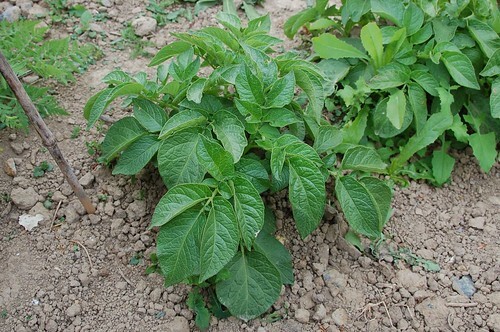 Of course, tiny yields are only to be expected with these earlies but that's o.k., by the time these 15 or so plants are finished, other potatoes will be ready for harvest. I notice that the BF15 are well budded up and flowers have started to emerge so maybe I'll try some of those in a week or two. I ate these with a little oil and salt. They're not the best flavoured new potatoes ever, although I'm told by people who still buy them that the Jersey Royals of the last few years aren't a patch on what they used to be, but they're not a bad flavour and if you had to have a dish of potatoes ready by mid May, if the Queen was popping in for supper say, then these do very well.